Obesity takes a decade off a person’s life span, on average, and it afflicts a third of Americans. That means it’s on track to rob the current U.S. population of a billion years of life. Dr. Jamy Ard wants to use digital technology to win some of those years back. Patients who participate in the weight-loss program he runs at Wake Forest Baptist Health in Winston-Salem, North Carolina, get a digital scale for home that transmits daily weigh-ins to Ard and his team. It also tracks physical activity, food choices, water intake, sleep and other factors. Average weight loss after six months is 10 percent of body weight, and 44 percent of patients lose 15 percent of body weight or more. “If we’re going to move the needle on prevention and cost savings, we’ve got to figure out how to deliver treatment strategies at scale while still maintaining an individual approach to each patient,” he says. Ard spoke with Newsweek contributor David Freedman about the opportunities in integrating obesity management and digital health. How are digital approaches useful for treating obesity? In most commercial or self-help approaches to losing weight, people tend to lose somewhere around 4 percent of their body weight. For people with more severe obesity and who have other chronic diseases, they do much better engaging in a comprehensive treatment program. The challenge for most people is to keep the weight they’ve lost off for a long period of time. Obesity is a chronic disease. If you stop the treatment, the relapse rate goes up. So we want to regularly engage patients in ongoing treatment for the indefinite future. That’s always been challenging, but technology now offers solutions. 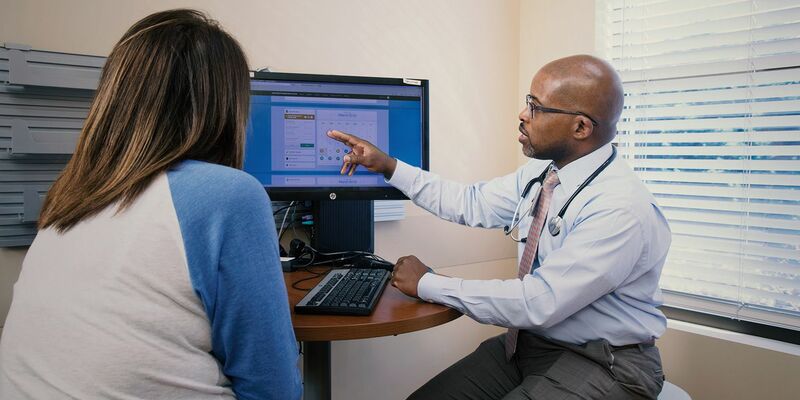 With remote monitoring and virtual clinician visits, the patient can remain in contact with a dietitian, a behavior coach, a physician. We can offer the equivalent of a full clinic–visit experience without requiring the patient to be there in person. What sort of patient population are you working with? We see about 750 new patients a year. They are typically middle-aged, 40 percent are African-American, and they’re from a wide range of socioeconomic situations, with a fairly high percentage on Medicaid or Medicare. Most have another chronic disease, like diabetes or high blood pressure. About 80 percent of our patients are female, which isn’t unusual for this sort of program. Men don’t engage with the health care system as often as women in general, but it’s even more true with obesity. How does artificial intelligence help this process? Obesity is related to a combination of things, including mental health, food preferences, physical activity, socioeconomic environment, culture, gender and other factors. Some of these are soft factors that can be hard to get specific information on, and they usually aren’t in the medical records. There could be a role for artificial intelligence if we can come up with standardized questions that the patient could fill out that would specify most of these factors. Then we could put it all into a machine-learning system that could spit out the probability of a specific treatment being successful for a specific patient. We don’t know yet if that can work in obesity, but in theory it could. But I think interaction with a human clinician will probably always be an important part of the process.